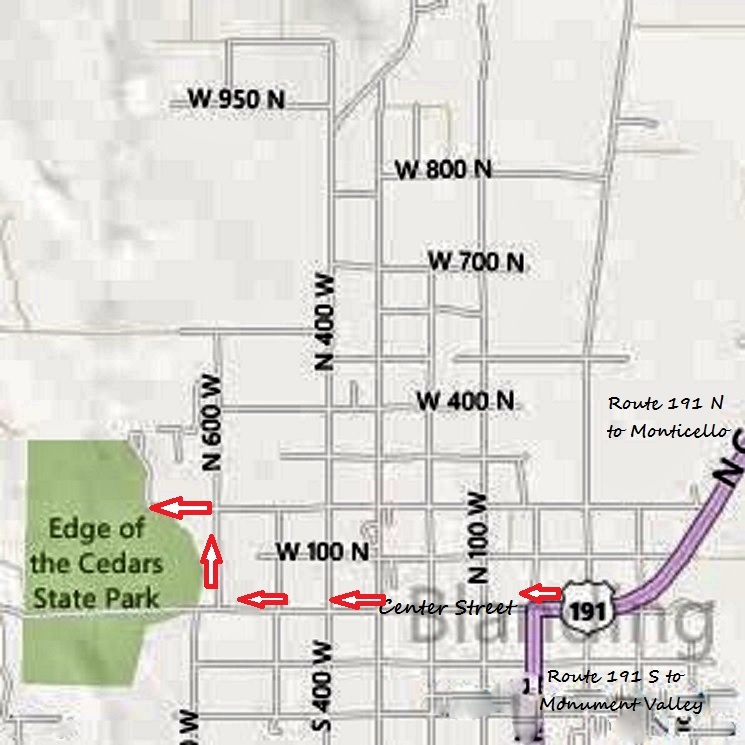 Edge of the Cedars Should Not be a Hidden State Park. Hidden away, at one of the edges of the city of Blanding, is a most wonderful museum full of ancestral Native American history. 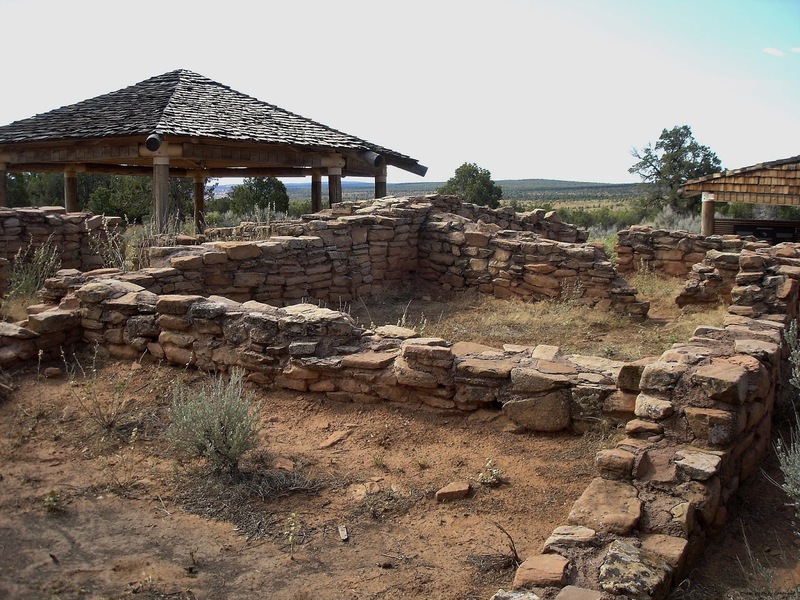 The Edge of the Cedars State Park is not only a museum, but the site of Pueblo ruins that was part of the Four Corners communities settled during 750 to 1300 A.D. When I say hidden away, I mean that this place of wonder is not easily found on the side of the major roadway, Route 191. Whether traveling south towards Monument Valley, or north towards Monticello; there is one blinking traffic light that will be the focal point towards finding your way to the Park. Currently there is a Chevron gas station on one corner of Center Street. 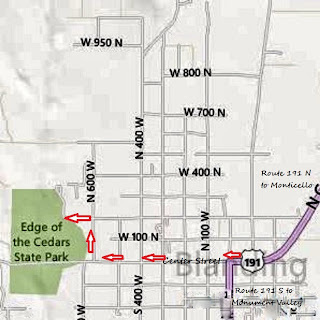 Drive west past the Chevron (straight on if coming from Monticello, or make a left if coming from the south) and continue down to North 600 West; make a right and then a left into the Edge of the Cedars parking lot. There are other ways of getting to the Park, but this is the easiest way if you're new to the area and do not want to travel the back streets too much. Also, there will be signs pointing out the way. There is an auditorium inside where you can watch a short video about the Museum; I highly recommend it as it gives so much information and keeps your attention at the same time. If you're truly lucky, you'll get to meet, or even go on a tour with, the museum curator, Teri L. Paul. She is very dedicated to the preservation of the artifacts, and her enthusiasm proves that as she talks about the pottery, weaving, ruins and many other items. Her voice is pleasant to listen to; she makes sure to answer your questions in a manner that only makes you want to know more. Now whether you have children with you or not, make sure to visit The Learning Center for a real education in what life was like for the ancient Native American cultures. Pay attention to the wall of artifacts; basically layers of earth and the "garbage" left behind throughout the centuries. For our current time, the claim to fame looks like it will be plastic soda bottles and cellphones...how embarrassing! The Museum has over 400 pieces of pottery representing the Four Corners area. 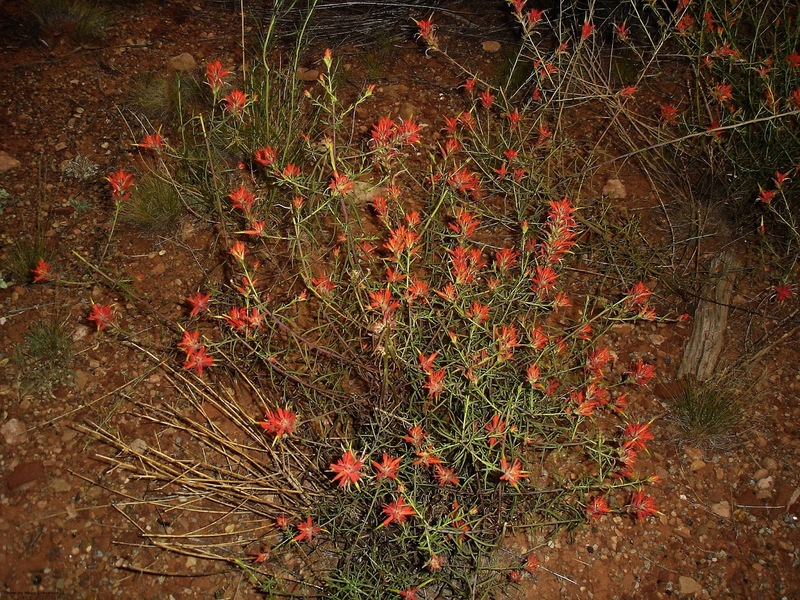 Many of the examples of red pottery are of a red clay whose source has not been identified; mineral tests have been done, but no match as yet. The uses of the pottery are everyday to ceremonial; miniature pottery could have been "toys" for children; or of a personal to ceremonial use in themselves. The "Visible Storage" is a glass enclosed room; a computer on the outside of the room allows visitors to look up any pieces of pottery to find its origin and history. Various tools are exhibited, including an extensive collection of arrow heads. Most impressive is the Macaw Feather Sash, found, in 1955, in a cave located in Lavender Canyon (Canyonlands National Park - The Needles District). The feathers come from a bird indigenous to Mexico, indicating trade with other cultures of that area within the Four Corners area. It is perfectly preserved, the feathers retaining their bright colors. On the interior walls of the Museum are framed photos, displays and copies of petroglyphs; all the artifacts are encased in glass. You will be fascinated, you will want to touch; but that is what The Learning Center is for. But wait....there's more outside! The exterior of the building is surrounded by sculptures, but it is the ruins in the rear that draws the most attention. This site is only one of several upon the grounds; maintenance is approximately $20,000 (U.S.) per year, so this has impeded work on the other mounds. Where are all those rich philanthropists when they're truly needed!?! Remains of wooden beams show that this home (possibly two families shared it) had experienced fire damage. One of the excavated Kivas can be climbed down into; while another also proved fire damage when the fallen in "roofing" was found preserved at its bottom. It's a wondrous place which makes you appreciate all the conveniences of modern living. 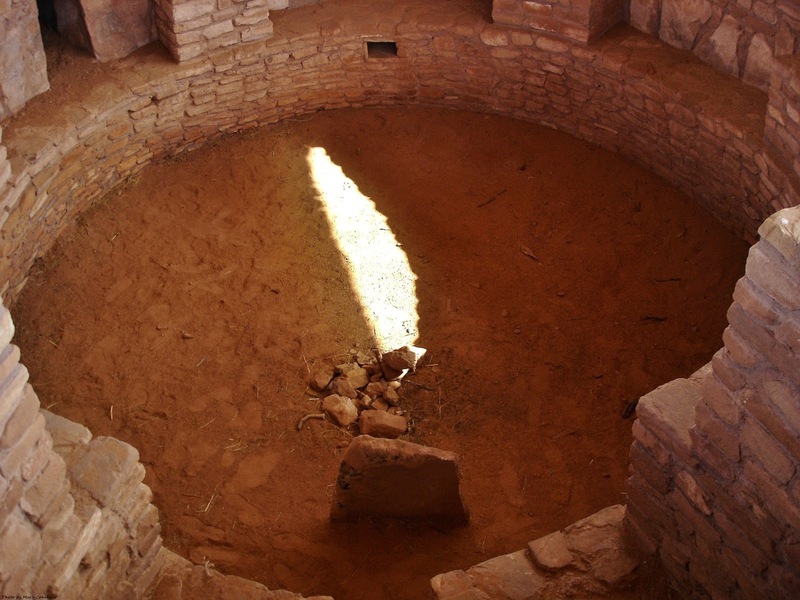 By the way, it is not unusual to find food offerings in the Kiva left by Native Americans to honor their ancestors. A little way, down a river rock lined walkway, is the "Sun Marker", created by Bluff artist, Joe Pachak. This sculpture represents the movements of light and shadows during the solstices and equinoxes; a way to measure time and seasons by the primitive peoples who had lived in the area. Personally, I was at Edge of the Cedars for a little over an hour, took almost 80 photos, and still think I should have spent more time there. If you rush through, then your heart truly wasn't into the visit in the first place. Before you leave, make a generous donation; if they get enough, perhaps another excavation can take place and be maintained. Don't miss out on this place!!! 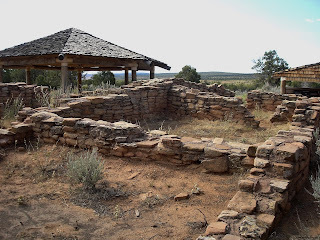 Butler Wash's Roadside Ruin; Another Taste of Cedar Mesa. In yesterday's post, I began my stories about State Route 95 with Mule Canyon Ruins along the roadside. Now I did warn my readers that I would be skipping around from state to state, region to region; not only to keep it interesting, but because of which memory wants to dominate my mind at the time. Anyway, I'm backtracking a little (about six miles east) towards Route 191 to visit Butler Wash Roadside Ruins; yep, you guessed it, there are more ruins further back in this area. Map time! To get to the Roadside Ruins, after parking in the lot, begin walking along the marked trail that begins at the wooden fence; the fence doesn't last for very long, so you'll just have to keep your eyes open for the rocks marking the trail. 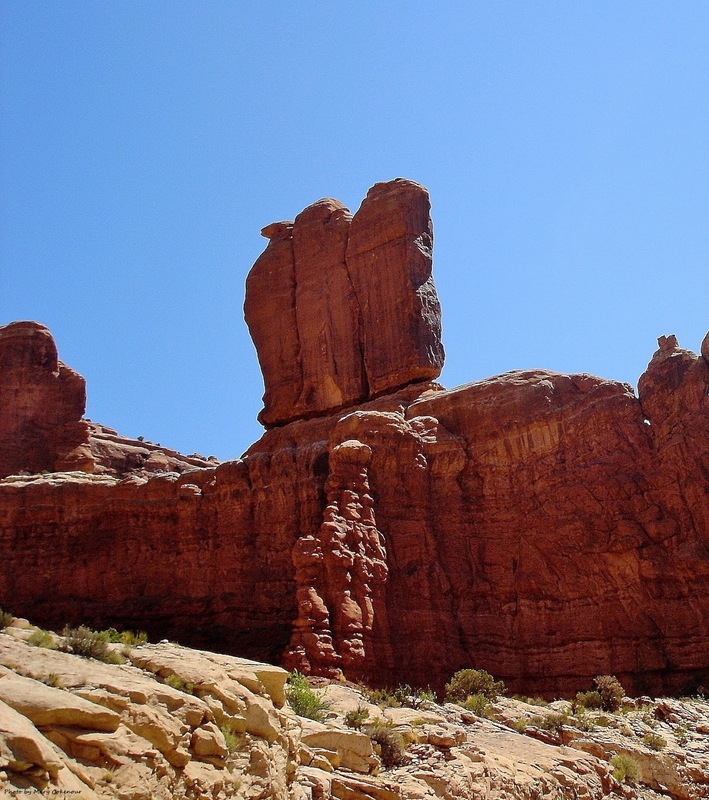 Most of the time you will be walking along slickrock which is easy to walk on when it is dry; when wet, you'll understand perfectly why it is called slickrock. Here and there will be little trails that will catch your attention and you might want to explore; just keep the main trail in sight as you can get very easily lost in this area. 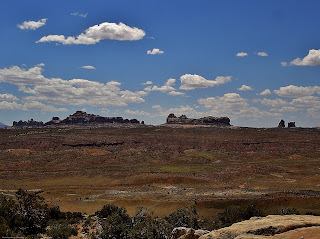 Stay on the slickrock, do not walk on any of the soil areas as they may be covered with a cryptobiotic crust; you know what, if it's black or dark brown, crusty looking stuff, DON'T walk on it. Better to be aware, than destructive. The trail to the Roadside Ruins is only a half mile walk (one mile round trip); depending on how long you take at the ruins, the whole trip might be about an hour in time. You will be climbing upwards at certain points, and the landscape is beautiful. Along the way, take time to notice the various plant and animal life in the area; awesome specimens of cacti, and the Collared Lizards are so colorful. Last leg of the walk, before you get to the ruin overlook will be upward on slickrock. I'm posting two photos of it and one is of me walking up the trail. Notice I have a white hat on, and a small backpack hanging off my shoulder; besides identification, snacks, first aid kit and sunscreen, there are two full bottles of water in that backpack. It gets hot, in the 90's the day we were at Butler Wash, but the very low humidity fools you into thinking that you, yourself, are not getting too warm, or dehydrating. Don't be turned off by how steep the walk looks, if I could do it, anyone can. The feeling, when you finally reach the top, is exhilarating!!! Now something you should know about slickrock is that the elements of wind and rain tend to develop potholes in the stone. When these potholes fill with water, microscopic life emerges; remember those "sea monkeys" you may have had when you were a little kid; those are actually brine shrimp and can be found in these potholes. It must have rained before we got to Butler Wash, as we found many of the potholes filled with water, but without a magnifying glass, we couldn't tell if anything was swimming around. I can't fit everything into that little backpack! At the top of this little world is the overlook of some of Butler Wash's ancient ruins; cliff dwellings dating as far back as 500 - 1200 AD (please excuse my hubby's arm in the informational board photo). The Anasazi used ropes and wooden ladders embedded into the stone walls to climb up to the cliff top, or from ledge dwelling to ledge dwelling. At Cave Spring, in Canyonlands National Park - The Needles District; I climbed up and down one of those ladders and am still wondering how I didn't kill myself. So trying to imagine how the ancient Native Americans lived this life on a daily basis is astounding to me. If you're feeling more adventurous, once you get back to the parking area, take a potty break, perhaps have a picnic lunch and then head out to the Upper Trailhead. Here's the information you need to travel it; and yes, this is still on my "to-do" list. To get to the Upper Butler Wash Ruins, cross the fence on the north side of the bridge from the trailhead; you'll see the trail register here. 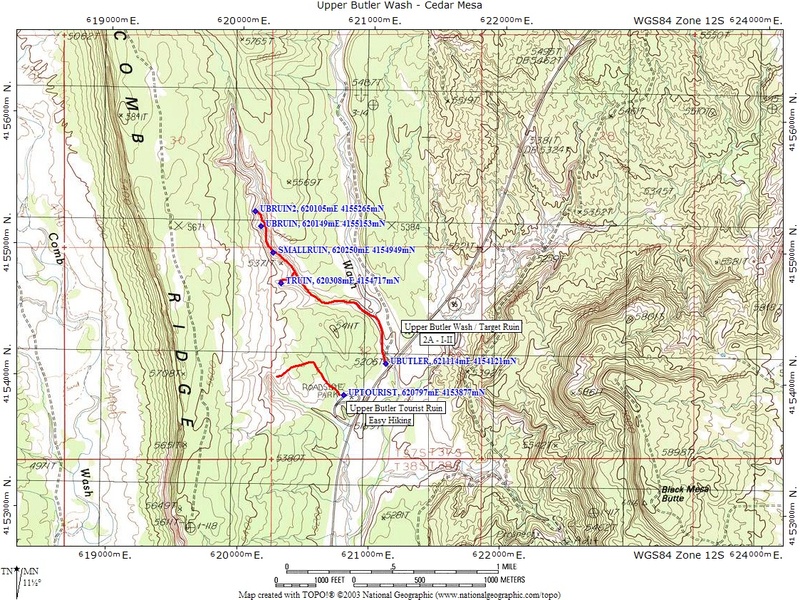 Walk this trail about 5-10 minutes to where the canyon and trail forks; go left here, following the canyon bottom as it deepens and turns to slickrock. About 30-45 minutes from the trailhead, you will see ruins on the left; about 5 minutes ahead will be another set of ruins; there will be a ladder there you can use to climb up to them. You'll also notice a side trail that will climb steeply upward for about 5 - 10 minutes before leveling out; you will be overlooking more ruins, and on one wall will be a painting of a target, hence the name "Target Ruins" for this area. You might also see two shallow holes in the slickrock; this is where a ladder once was for traveling up and down to the dwelling by the Anasazi. This will take 2 to 4 hours round trip depending on how much you want to see, how much time you want to spend there, and how easily, or not, the trail is to walk. 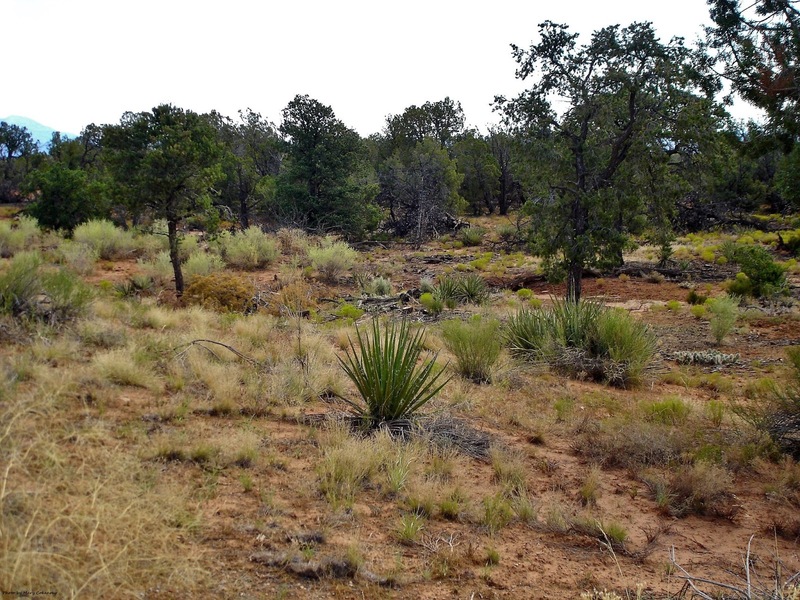 Here's your other sample of the Cedar Mesa area, and I do hope you're developing a taste to see more and more. Don't forget to always make sure your gas tank and water bottles are full; but most of all, have fun! 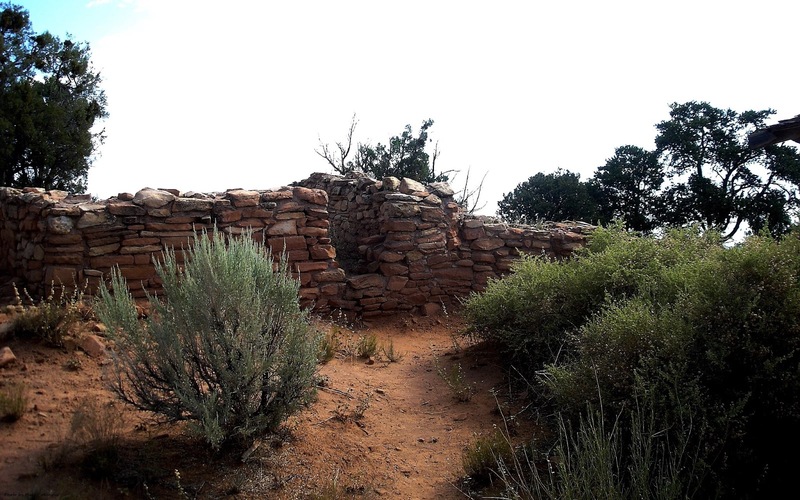 Mule Canyon's Roadside Ruin; a Taste of Cedar Mesa. 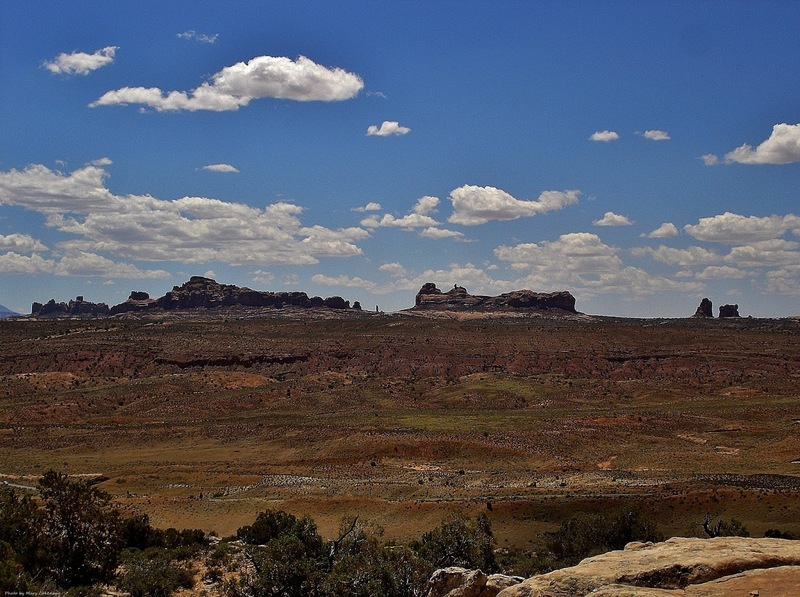 Traveling south on Route 191 from Blanding, past the airport is State Route 95 (Bicentennial Highway) which can take you to Hite, Hanksville, Lake Powell, or to Route 24 which will help you further west, or back north, in Utah. 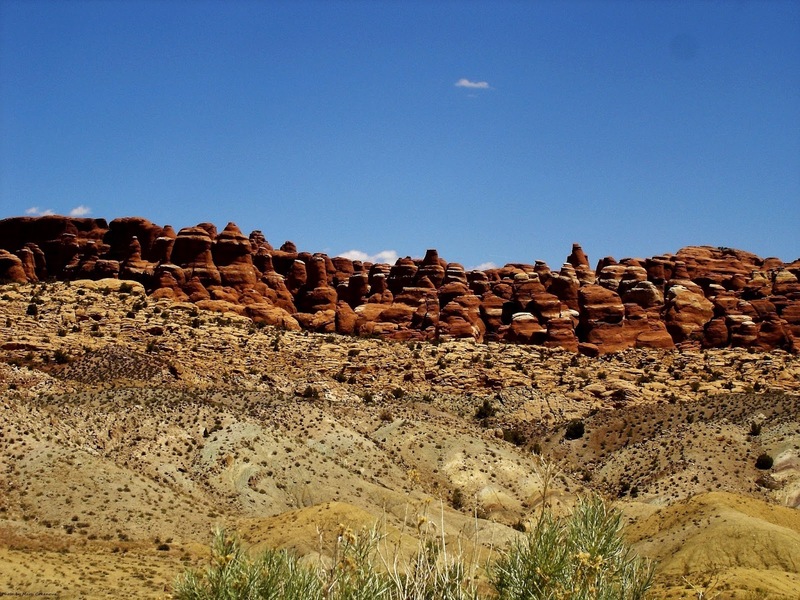 Those are only a few of the places you'll want to visit along this scenic stretch of highway; there are extensive canyons, sandstone formations and Native American ruins to explore as well. 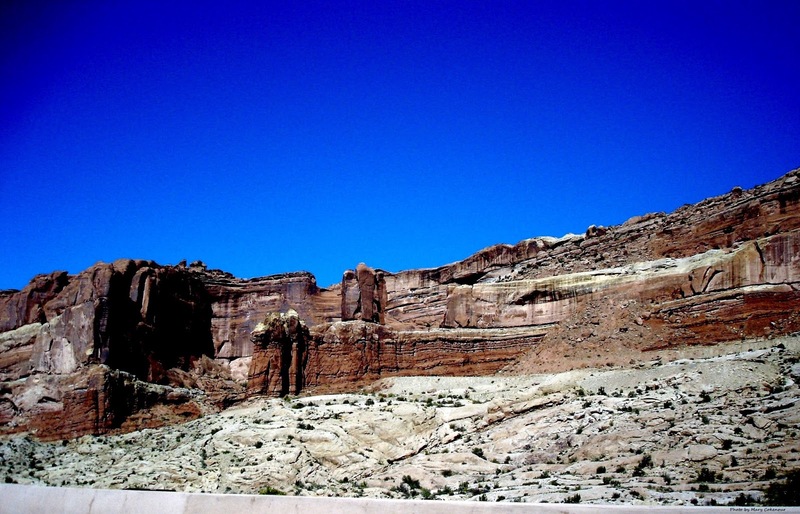 Now while Mule Canyon is not the first set of Native American ruins you'll come across (20 miles along SR 95), there is a good reason they're called "Roadside Ruins". Mule Canyon is actually part of the Cedar Mesa section and is a much larger community of ruins than you'll see off SR95; consider this just a taste. After parking in the paved lot, take a short stroll (1/8 of a mile) along the concrete walkway to the ruins; a Kiva and part of a tower. 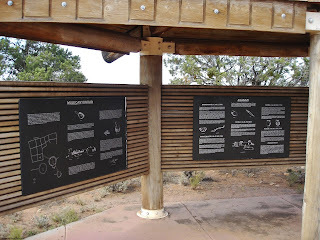 The Kiva is protected by a wooden canopy holding informational signs; you can look completely down into the Kiva, but you really shouldn't be climbing around inside. Think of it this way, would you like a bunch of strangers climbing around the walls of your place of worship? 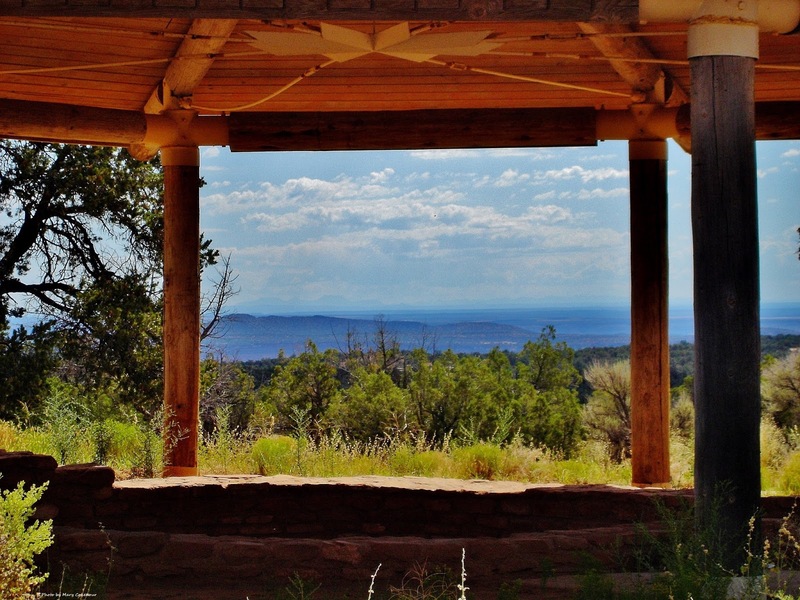 The Anasazi that lived in this area some 700 years ago may be gone, but their spirits....? Plus it is a preserved area, and you should just be respectful; simple common sense. 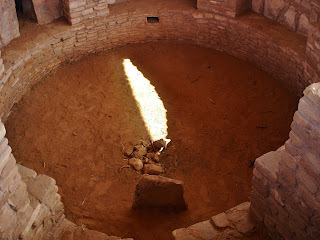 The day I was there was very sunny, and the shaft of light hitting the floor of the Kiva almost looks to be in the shape of a feather. It is very quiet; I couldn't help but stand still, and listen if I could hear any voices from the past. All I heard though was a raven trying to have a little conversation with me, but he gave up after a few minutes. There is not much left of the tower. If you intend on taking photos up close though, stay on marked trails; you won't step on any cryptobiotic soil that way. The landscape around the entire area is a mixture of desert and brushland; makes you wonder how did the ancient people survive in this desolation. I have to admit I am spoiled, and wouldn't do well without electricity or indoor plumbing. 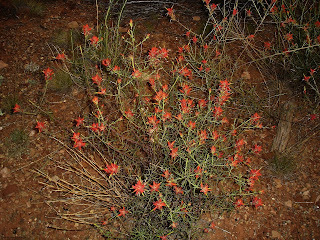 Yet the landscape is not without some color; for example the bright red of the local "Indian Paintbrush". Now when I first visited Mule Canyon, I wasn't aware that this was simply the "Roadside" part of the community. I recently found out that there is a trailhead up the road that leads to another 5.5 miles of ruins to explore (the entire hike is 11 miles round trip on rough ground). 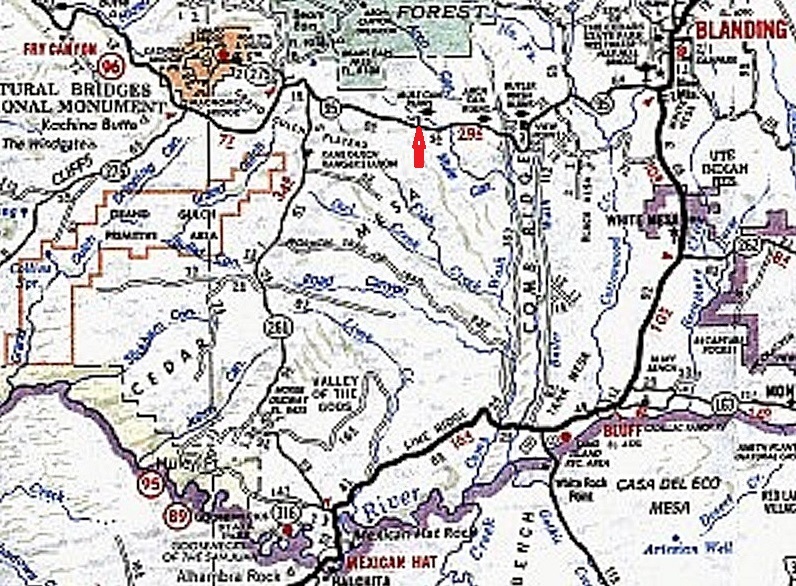 To get to the trailhead, drive east on SR 95 for about 1/2 mile to San Juan County Road 263 (Arch Canyon), and then north on that road for about a third of a mile to the parking area. 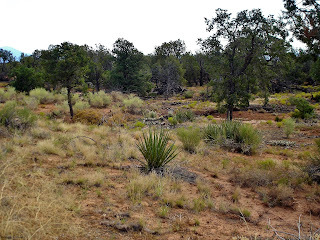 There is a self service station to get a day permit for hiking; the BLM maintain this land. You guessed it, another adventure to add to my "to-do" list; well how can I just see a little bit, and not want to see it all? 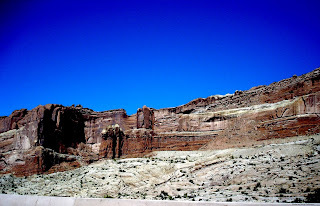 I'll be writing more about travels along State Route 95 all the way to Hanksville, picking up Route 24 and visiting Goblin Valley, before getting back to Interstate 70 and heading home to Monticello...a full loop you might say. I'm exhausted just thinking about it! Salt, Fire, Penguins, Odds and Ends at Arches. 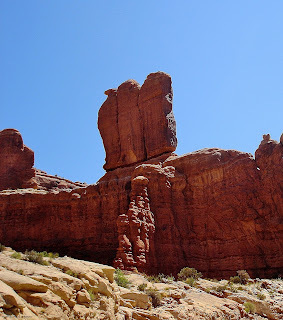 Going through my thousands of photos taken over the past seven years, I still find a photo here and there of Arches National Park and wonder, "what the heck is that?". As I research the section of the Park I wish to write about, I usually, by accident, find a photo resembling one unknown one I have and bingo!, I've got a name. 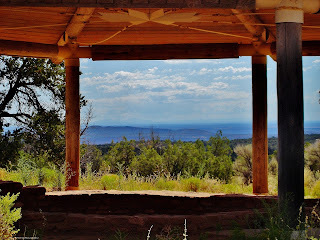 So while my intention for this post is to focus on the Fiery Furnace and Salt Valley Overlook; I'm going to throw those odds and ends in here. Fiery Furnace and Salt Valley Overlook are past the Delicate Arch area, and on your way to Devil's Garden. They are the type of sites you come up on unexpectedly, hit the brakes and hope no one is tailgating behind you. The Overlook is basically a view of Salt Valley Wash; there isn't truly much to see there in way of formations, but it is still an awesome site to look over. There is an eight mile, unpaved and bumpy, road that leads over the Wash to Klondike Bluffs; a car will make it over, but 4 wheel drive is the better way to travel. Now the Fiery Furnace is a truly Holy Moly! site to stop and look at. 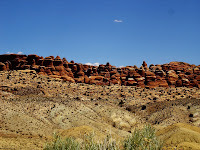 The Furnace is two miles of narrow canyons and fins of sandstone; the marked hiking trail can take from 2.5 to 3 hours; and that is using the highly recommended tour by a park guide. You can go it alone, so long as you purchase your permit; however reservations are required (alone and tour) and must be made online at: http://www.recreation.gov at least four days in advance. I'm warning you now that during tourist season (April through September), there could possibly be a waiting list to get a permit, or be included in one of the guided tours. 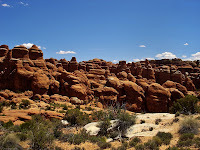 During the hottest months of summer, I recommend taking the earliest tour possible as while it is cooler in the Fiery Furnace (ironic, isn't it); the rest of Arches will be extremely hot when you finish the tour. That takes care of Fiery Furnace and Salt Valley Overlook; now to get to those Odds and Ends I found. Lets start at the beginning, the beginning of Arches National Park that is. After you pay your entry fee, you'll be able to look upwards and see that you're being greeted by three gentlemen wearing tuxedos. Well, if they were living creatures, that is usually how they're referred to, but these are actually stone giants called "The Penguins". 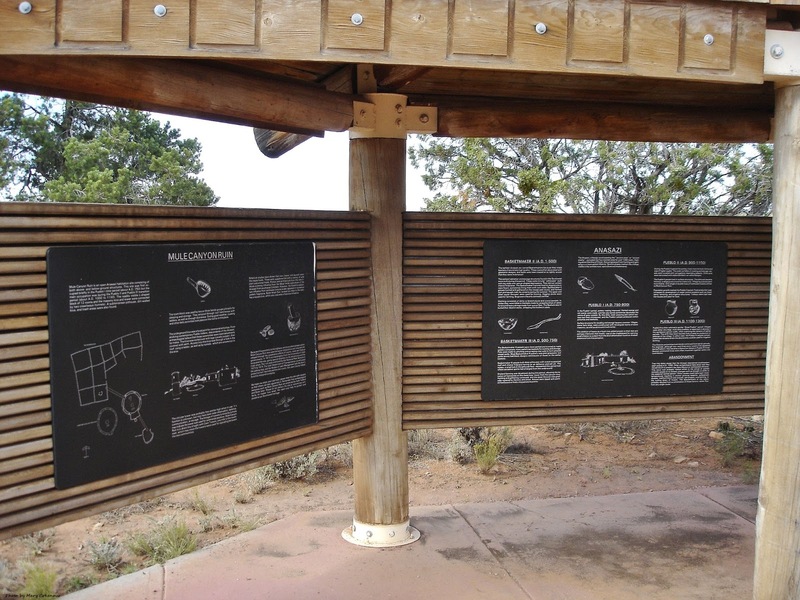 Now this next item I first saw mentioned when doing some research on the internet about the La Sal Viewpoint section of Arches. I didn't really think anything about it though, as I was concentrating on finding the best photos of the area itself. While I was organizing photos, or attempting to, I was surprised to find I actually had a photo of this minor arch...Ring Arch which is located at the base of Courthouse Towers. It is one of those, blink and you miss it things if you're driving along; you have to stop, look and find it. My last, " I can't believe I have this photo" is of Pothole Arch, located in Ham Rock which is part of the Windows District. It is one of those arches that someone in your vehicle has to spot and say, "hey, is that an arch up there? "; otherwise you'll just drive by without even noticing it. On the Arches National Park map, Ham Rock is mentioned, but not this arch; isn't that odd? But then again, Ring Arch is not mentioned either...perhaps there are so many arches at the Park, all the names can't fit on the map? Think of it as a treasure hunt for gigantic items; make sure to write the names down on your map as close to their location as possible. That's it for this post about Arches; all I have left is Devil's Garden and that will most likely be a two or three part story; that section in itself is immense! I hope you've been getting a good idea on why I've stated that you need a minimum of one day dedicated to visiting Arches, and you still might not see it all. Long Canyon via the Shafer Trail. Rock Crawling Around Black Ridge. Lovely Lake in the Little Valley - Vallecito. Lost from Bluff to Cortez; Sort of. 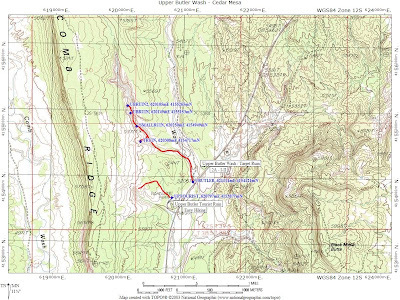 Moab's Kane Creek; Boulevard or Road? Jugs and Mugs, but are they Arches Too?